The Biblical Arcade at GodMadeUs.com. Play, Learn, Grow. These games are designed to help people gain the skills needed to get the most out of sermons. Have you ever found yourself fumbling through your Bible trying to keep up as the pastor moves from scripture to scripture? These games can help you learn to quickly find any book of the Bible. Find The Book - 10 levels of learning fun. The game starts slow and builds with harder and harder challenges. 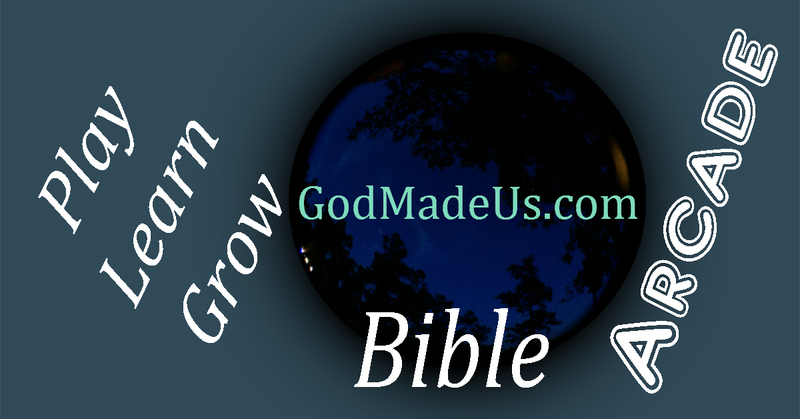 Master the three basic skills in this game to find any book of the Bible quickly and easily. If you can beat this game, you will have no problem following along in your Bible during sermons with a lot of book changes. All of the games below are included in the above game. Use them to practice any of the levels you may be having trouble with. New Testament - Old Testament - Identify whether the book belongs in the Old Testament or the New Testament. Timed New Testament - Old Testament - Set the timer, then identify whether the book belongs in the Old Testament or the New Testament. How many questions can you answer before time runs out? Bible Flip - The player is given a starting book and a book to find. The player must decide whether to flip left or right in order to find the book. Players are given instant feedback with the correct answer when a question is missed. How many times in a row can you answer correctly? Psalms Bible Flip - Psalms is often a good place to start when looking for a Bible verse. This game will help you learn to flip right or left, once you are at Psalms, in order to find the book you are looking for.